I’m always on the look out for quick and simple snack ideas for the girls to have after school or at the weekend. 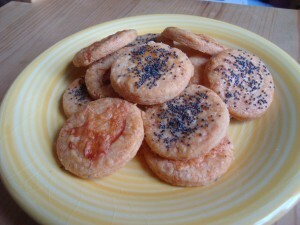 These little cheesy biscuits are ideal because they are so easy to make that the children can join in too. I cut mine into circles but you could experiment with all sorts of shapes. They’d also be great in lunch boxes – something a bit different from sandwiches. 1. Cut the butter into cubes and put it into a food processor with the flour and grated cheese. 2. Process the mixture until it comes together to form a dough. You shouldn’t need to add any liquid – the butter will bring it together. 3. Make the dough into a ball, wrap in clingfilm and chill in the fridge for at least 30 minutes. 4. Preheat the oven to 180°C and line a baking tray with some greaseproof paper or baking parchment. 5. Roll out the dough on a lightly floured surface until it is approximately 3mm thick then cut out your shapes. 6. 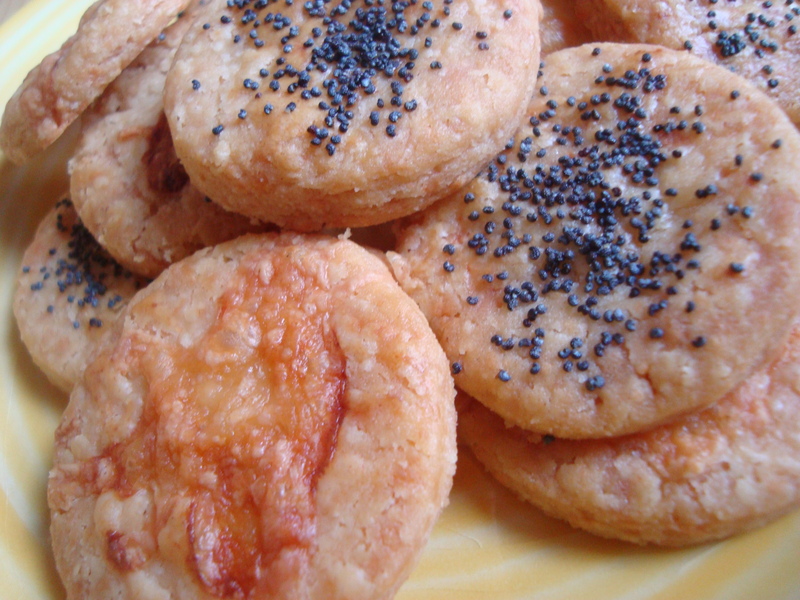 If you want to add a topping such as a little grated cheese or some poppy seeds, lightly brush the top of the biscuits with some milk and sprinkle over the topping. 7. Place the biscuits onto the baking tray and bake in the centre of the oven for approximately 10-12 minutes, until they start to turn a golden brown colour. 8. Remove from the oven and leave to cool on the tray for a couple of minutes before transferring to a wire rack to cool completely. Try not to eat them all at once! These sound yummy & I agree that they will make the most ideal after-school snack. My 2 monsters are always hungry! Lol, I know how you feel – my two are constantly demanding food!